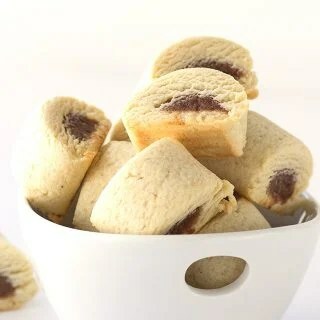 Date filled cookies are a simple but delicious cookie and this easy cookie recipe is a must try! 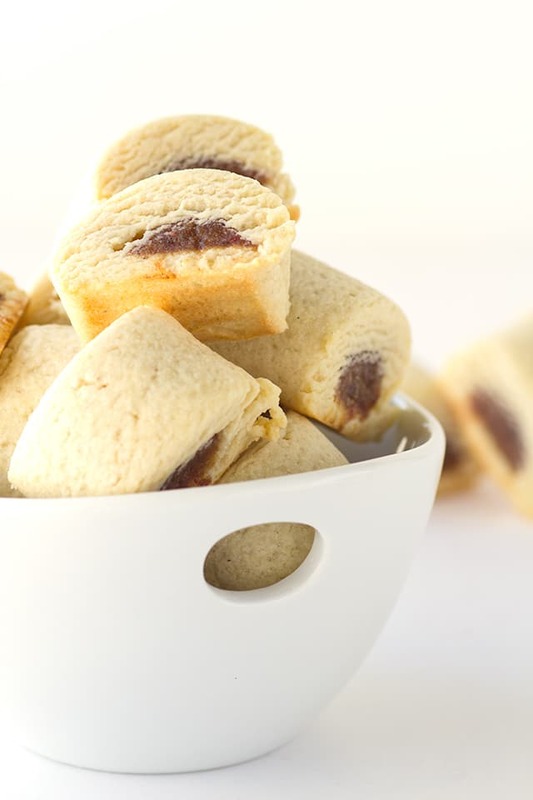 They remind me of Fig Newtons, but with a better texture. They’re pretty, too! Date filled cookies are the bees knees! Last week, for the first time ever, I tried dates. Try the World sent me a date spread that I wanted to use in a recipe. I gave it a taste and thoroughly enjoyed the taste and texture so I went out and bought the real deal. I used the dates and the spread in this simple cookie recipe and they both came out perfectly! 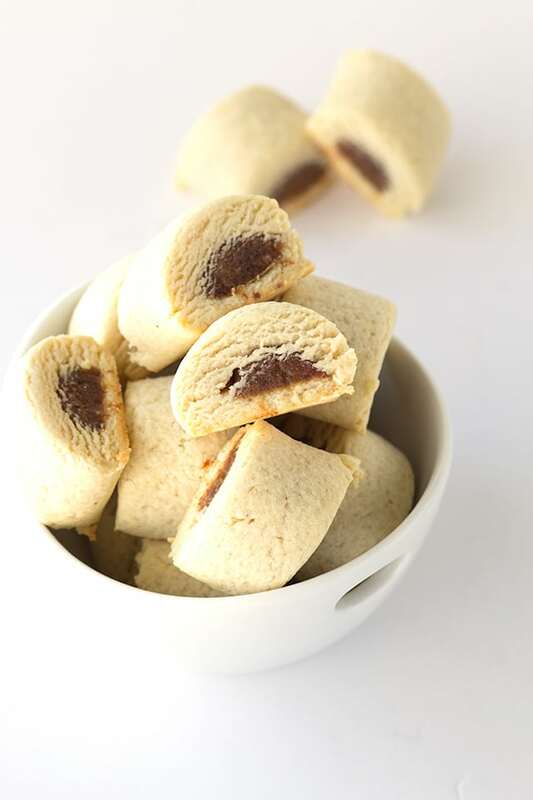 I need to go out and buy more because the date filled cookies are so addicting. I’m in it for mostly the texture, if I’m honest. I adore the caramelized flavor that comes along with the texture though. I feel a sweet and salty recipe happening with them. In case you aren’t counting, there are 9 days left before Christmas day. 9 days to get all of your shopping done, whether it’s for presents or Christmas dinner. We still have to finish up our shopping which will hopefully be done tomorrow. We’re also stopping in for an early afternoon showing of the new Star Wars movie before doing our shopping. I’m basically only in it for the buttery popcorn and recliner seats. We bought them to surprise our 5-year-old that has watched all of the Star Wars movies and insists he needs to go see this one too. Did I mention our son was an x-wing pilot for Halloween or that he asked Santa for a BB-8 that actually moves around this year? He’s a mini die hard fan. One last thing before I share the date filled cookies recipe. Today is the last day of my 9 days of giveaways! I’ll be giving away a Try the World Holiday Box. If you want to enter, head over to instagram and enter! In a large mixing bowl, add in the butter and sugar. Beat on medium/high until light and fluffy. Add in the vanilla extract and eggs one at a time. Scrape down the sides of the bowl and beat to incorporate any remaining egg. Add in the flour and salt. Beat in the flour until it comes together into a dough. It will become dry and crumbly before it comes together. Once it comes together into a ball, place onto a large piece of wax paper. Roll it out into a long narrow dough. I would say mine was about 20 to 24 inches long and 8 inches wide. I trimmed off the edges to make the lines straight. You can use the extra dough to fill in any gaps. Cut the dough lengthwise so you have two 20 - 24 inch pieces of dough. If you're using date spread, add it into a sandwich bag and pipe it into a straight line towards the edge of the dough. Do it on both of the strips of dough. If you're using the 12 oz. container of pitted dates, add them into a food processor or blender. Blend until a ball forms. Divide the ball in half and roll each half into a 20 - 24 inch strip. Make it as long as your dough. Roll the date spread/puree into the dough. I grab the edge of the wax paper and pull it straight up to roll the dough over the date spread/puree. Roll to the end of the dough and repeat with the second strip. I rock it back and forth a few times to even out the strip. Pinch the strip of cookie dough as you cut slices. That will help it keep its shape rather than going flat. I sliced the cookies about an inch thick. Place on the prepared baking sheet. Place into the oven and bake for 12 minutes. Remove from the oven and cool for about 5 minutes before moving them to the wire rack to cool. I was sent 1 Try the World box to try and create with. I was not compensated and bought the box that I’m giving away. This post contains affiliate links. These cookies look absolutely perfect, and so delicious!